A school was opened at Rainscar Farm on September 14th 1908 mainly because the LEA had been forced to respond to a situation which had arisen with the parents of the children from the farm concerning their education. Mr Harrison who was tenant of Rainscar, used to board his two elder children with their grandmother in Kirkby Malham in order for them to attend Kirkby Malham United School. This cost him 25/- per week. Because of the cost, he discontinued this arrangement and threatened to cease paying the Education Rate unless a school was provided for the children. ‘There are I understand only 4 or 5 children up somewhere at the back of Pen-y-gent’. A room at the farm was to be used as a schoolroom and although the LEA had some doubts about its suitability, they agreed for its use as a temporary school for one year. It was 14feet x 10feet giving 140 square feet which was adequate to accommodate the seven pupils who were to attend. It had a concrete floor, no playground, no fireguard and no arrangement for artificial light. There was also concern about the ‘office’ – a polite way of discussing the toilet arrangement. There was only one toilet which was used by the family but as five of the children who were to be pupils lived at the house anyway and there were to be just two other children, it was decided that this would suffice in the short term. So the school opened on September 14th 1908 with five Harrison children and two Spencers, the teacher being a Miss H E Haining. Desks had been supplied, a teacher’s desk and chair, a cupboard, and a blackboard but no easel. The first inspection was carried out on November 7th when the inspector pointed out the lack of a fireguard and the easel. No special books or stationery had been provided, the teacher having to manage with her own books and some items borrowed from a school in Settle. Of even greater concern was the fact that there was no copy of the Regulations as required under the Education Act of 1870 on display. This was something called the ‘conscience clause’ which meant that any parent had the right to withdraw their children from religious instruction if it was against their own beliefs, and a copy of this clause had to be displayed in a prominent position. Until this was displayed the Board of Education would not put the school on the grant list. The LEA were informed of these deficiencies by the Board of Education and the conscience clause was supplied to the school by the end of the year and the school then qualified to be placed on the grant list. ‘[the] remote, little school is doing well. The teaching is careful and sensible and the children are clearly making steady progress’. There was still a shortage of equipment and the inspector requested a map of Yorkshire. The schoolroom had been colour- washed and was clean and tidy. There seems to be very little more information about the school until its closure in 1918 although we do know that the farm had new occupants, the Coates family who only had three children. The numbers attending are shown in the document below. In December of that year the LEA applied to the Board of Education to close the school as they did not feel they were justified in providing a teacher. At that stage there were eight children attending, one of whom would be thirteen in a few months and was then intending to apply for a ‘labour certificate’. Four of the children lived equidistant, about two miles, from Rainscar School and Halton Gill School and arrangements would be made for them to attend Halton Gill. The problem came with the three children from Rainscar Farm who lived too far from the nearest school to travel daily and would have to board. 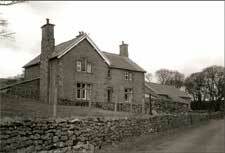 The nearest school would have been Stainforth but the school of choice for the parents was Horton-in-Ribblesdale. Reading between the lines of the internal minutes it would seem to have been deemed that the children would get a better education there and the parents seemed happy with the closure of the farmhouse school. There was however the question of whether the LEA would pay for the boarding costs of the three children, but they were not obliged to do so. It would appear that there were no ‘serious disadvantages’ because the farmhouse school at Rainscar remained closed after a life of only eight years. Documents ED 21 / 20318 The National Archives, Kew.